This set of photos comes to you by request – your request. Every week, sometimes as often as every day, a particular phrase pop up in my search referrer logs (the bit in my stats which tells me what people were searching for on Google or other search engines which led them to click through to this site). Several people a week, over the last three years, a steady stream from around the world, adds up to quite a few views over the years, and all looking for empty sea. This blog is actually the first result presented on Google for “images of empty sea” and the second for the text phrase “empty sea”. This all stems from a post I wrote almost five years ago, talking about a particular scene in a book I had just completed writing, then known as “Somewhere Down The Crazy River” but since published as “Shiprocked – Life On The Waves With Radio Caroline”. 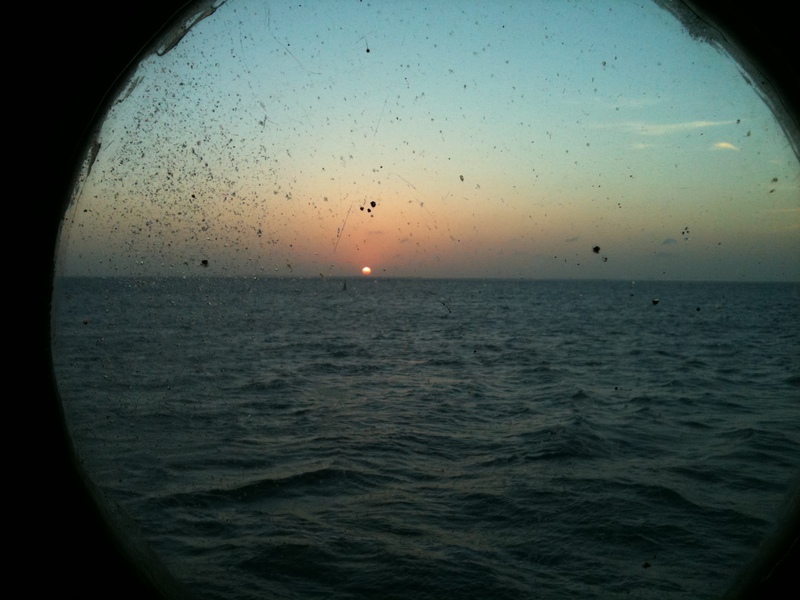 The post contained a shot of the view from the Caroline ship – nothing but the horizon and empty sea. And it’s that picture which has brought people here. But since so many people come to look for it, and the sea is, and always has been, my lover, I’ve decided to share a few more of the intimate pictures taken during our many trysts. 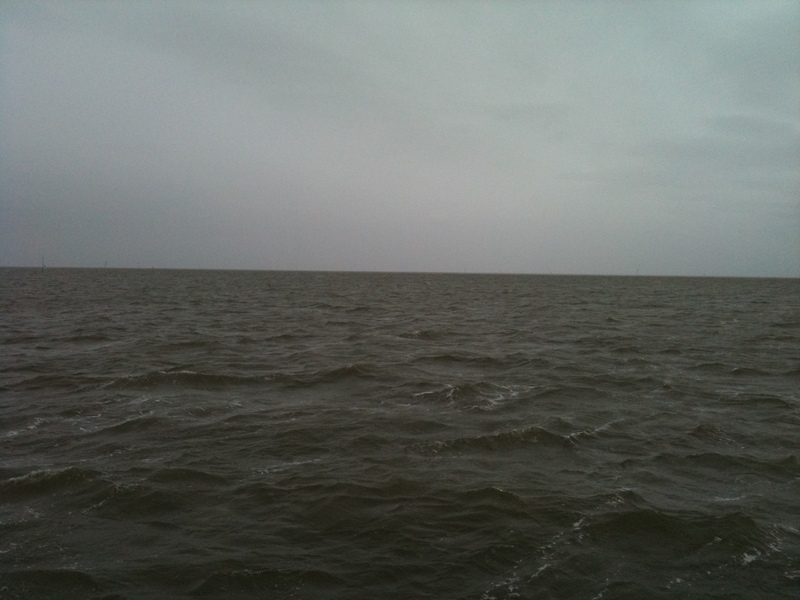 It’s not all sunshine – a classic grey sky, grey sea, so often the view. As always, you can click on any picture for a bigger version. 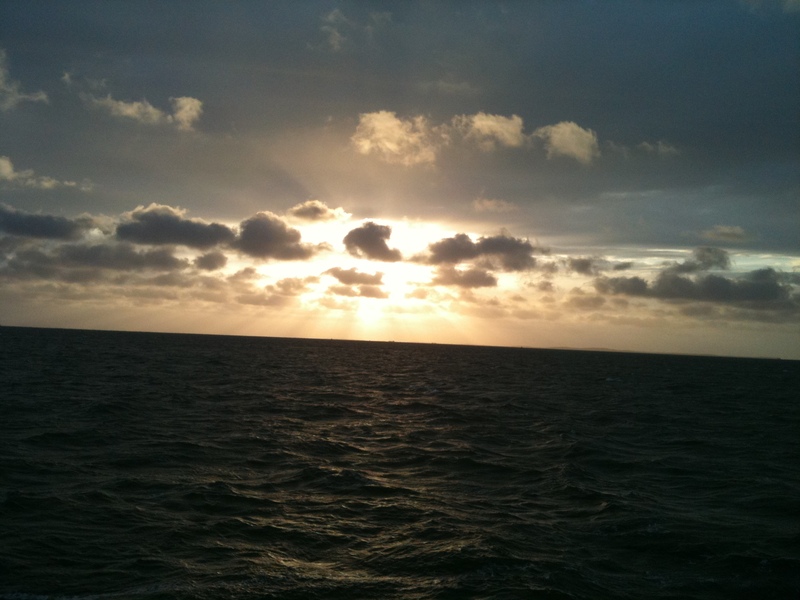 All pictures taken of the North Sea (or its daughter the Waddenzzee ) off the English and Dutch coasts, unless otherwise specified, during my stints on Radio Caroline and Radio Seagull. Let’s look through . .the round window. What do we see? . . the empty sea. 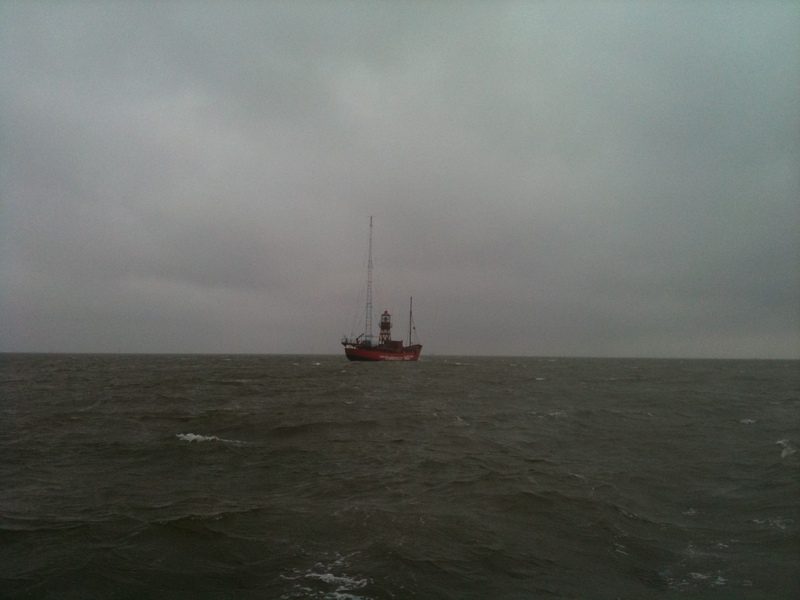 When I went to work on the offshore radio ships, people kept asking if life was boring. After all, the sea was the sea, and was always the same they reasoned. Boring? 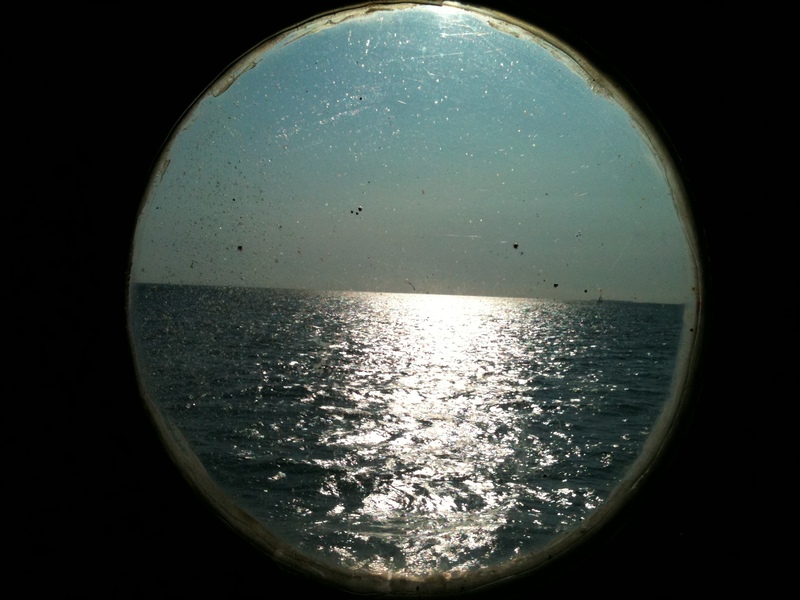 When the view through the porthole is never the same two days in a row? 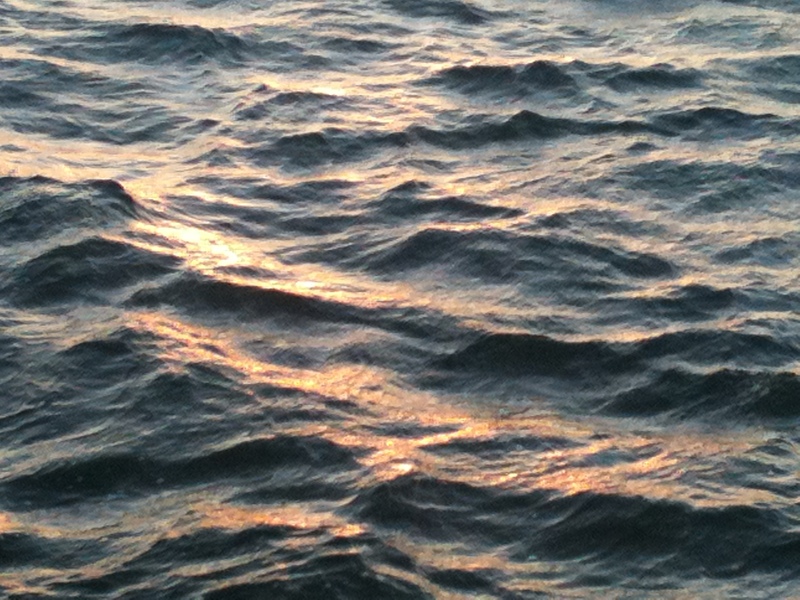 The sea is a mistress of infinite moods. 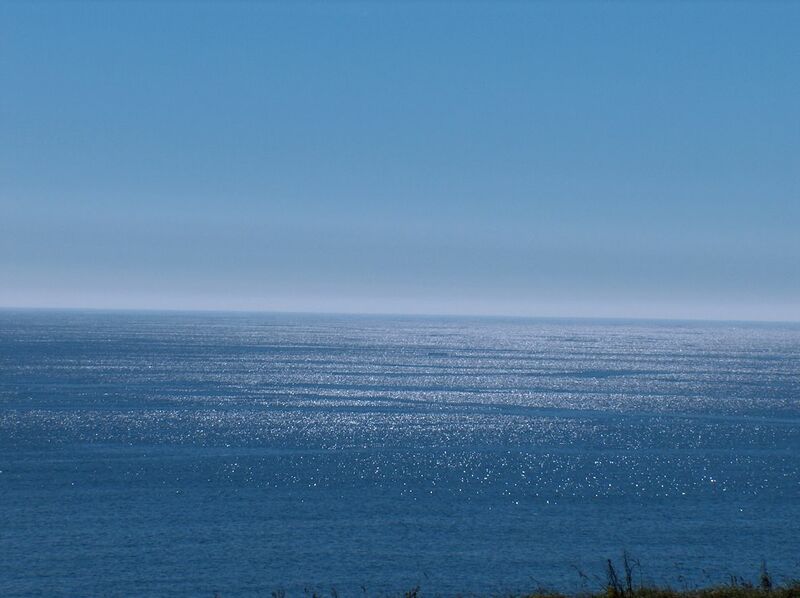 Blue sky, blue sea, an unlimited horizon on the Atlantic. 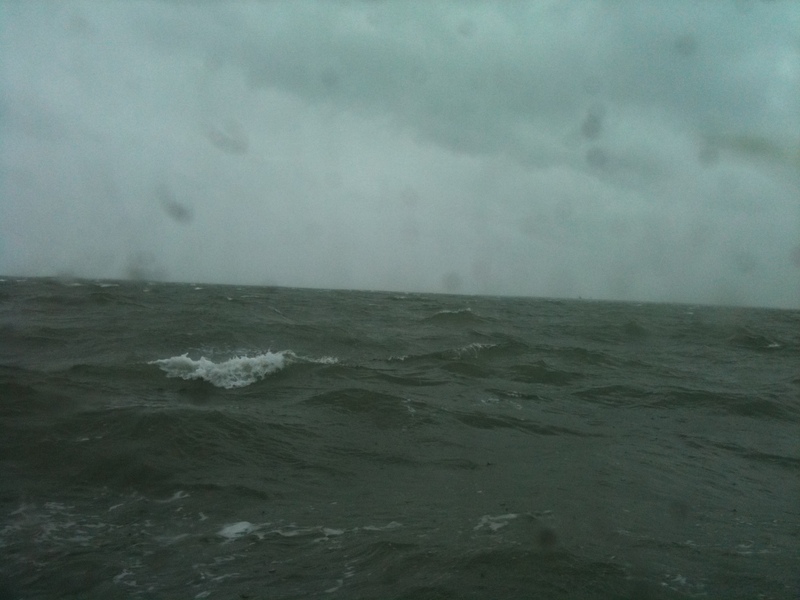 A cold wind, and a lumpy sea – slight to moderate in nautical terms. 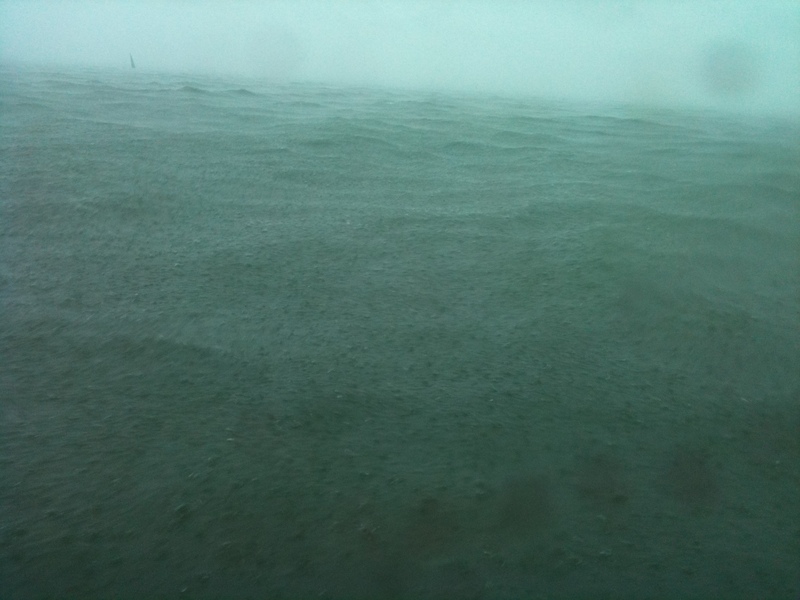 The almost dreamlike quality of the sea pounded and smoothed by a torrential downpour – photographed through a porthole at eye-level to my bunk – what a gorgeous way to wake up! 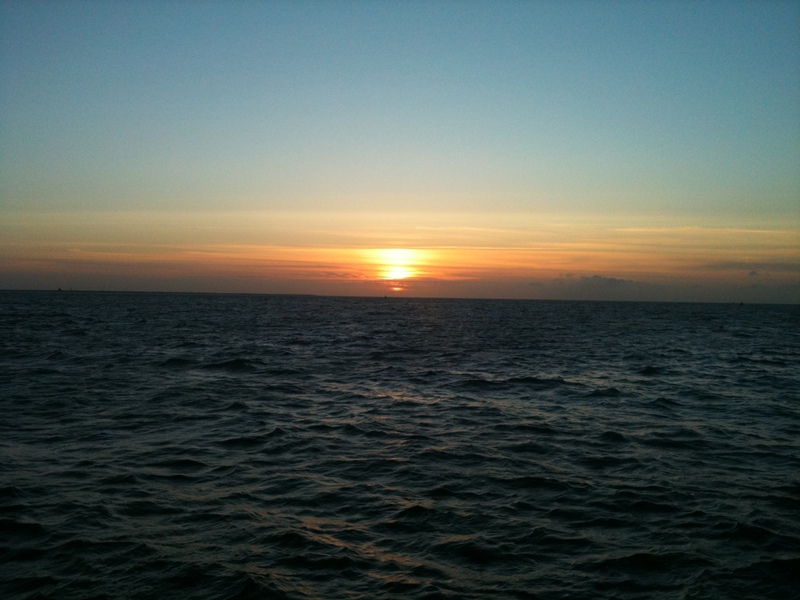 Sunrise complete – 5.26AM in early June. So, those are the “empty sea photos. 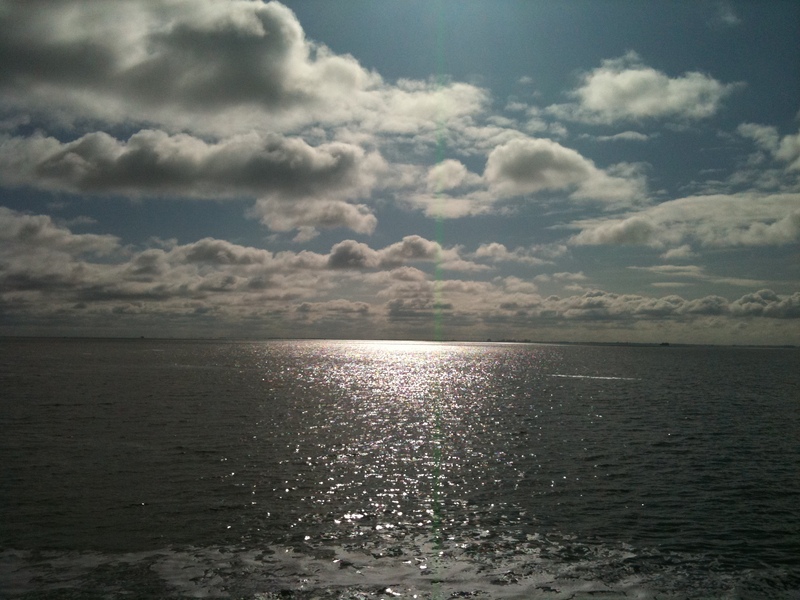 Below I include a couple more, where the sea is not quite empty, but which I feel are similarly beautiful. 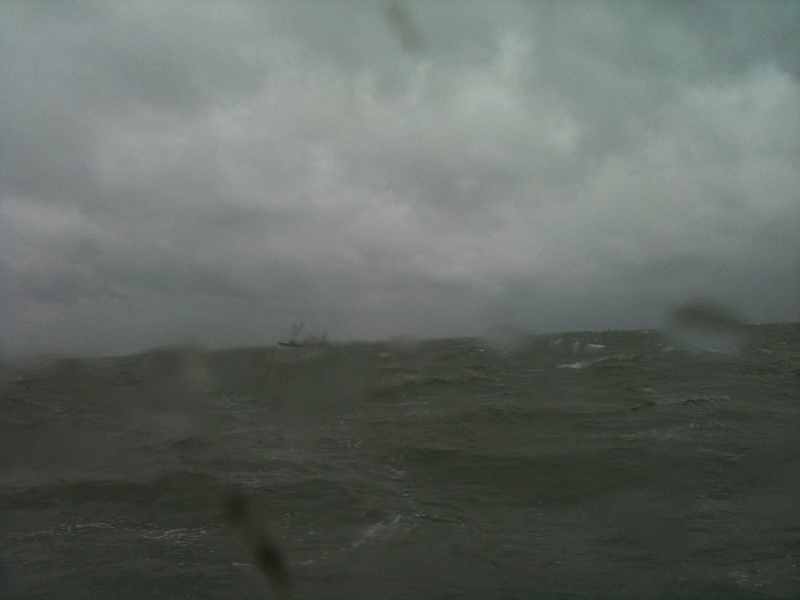 For some reason this photo brings back the most intense memories of the “feel” of being at sea – grey skies, moderate sea, and a fishing boat just glimpsed through a spray-streaked porthole. 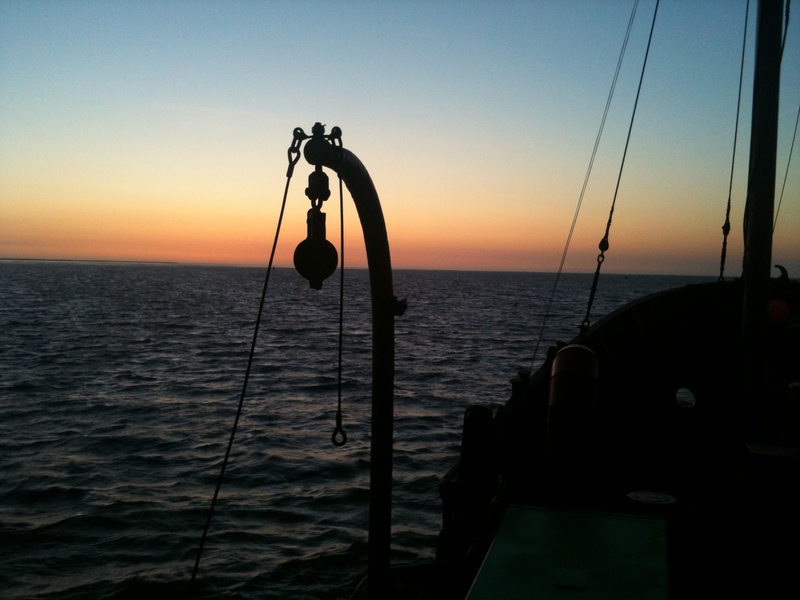 I can almost hear the wind moaning in the superstructure . .
4.55AM, I’ve been on watch overnight, and am just about to make another round of the ship and check anchor chain in the pre-dawn light. A little later, and the sun is risen. Wonderful experiences and a great life. 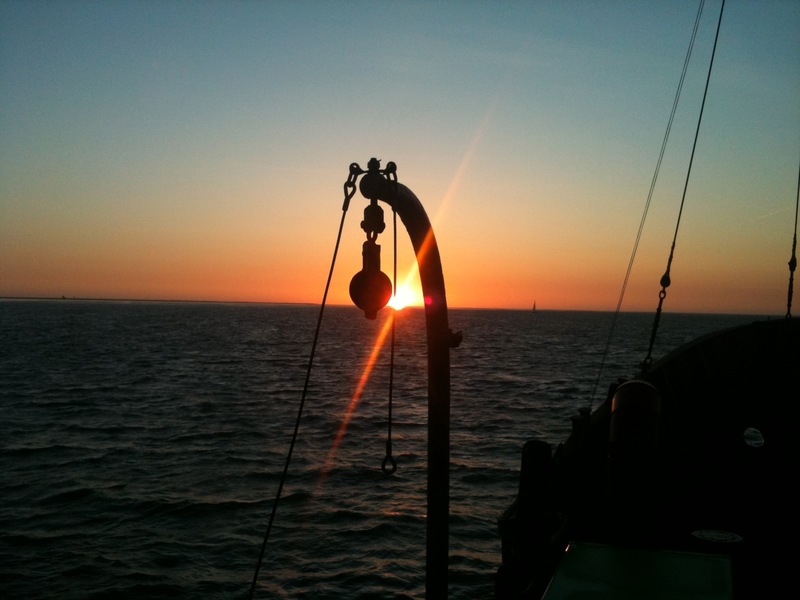 The radio was exciting, but the sea was always breathtaking. Always my lover, I’m not sure if I possess her soul, or she mine. Absolutely brilliant Steve. Wonderful pictures. 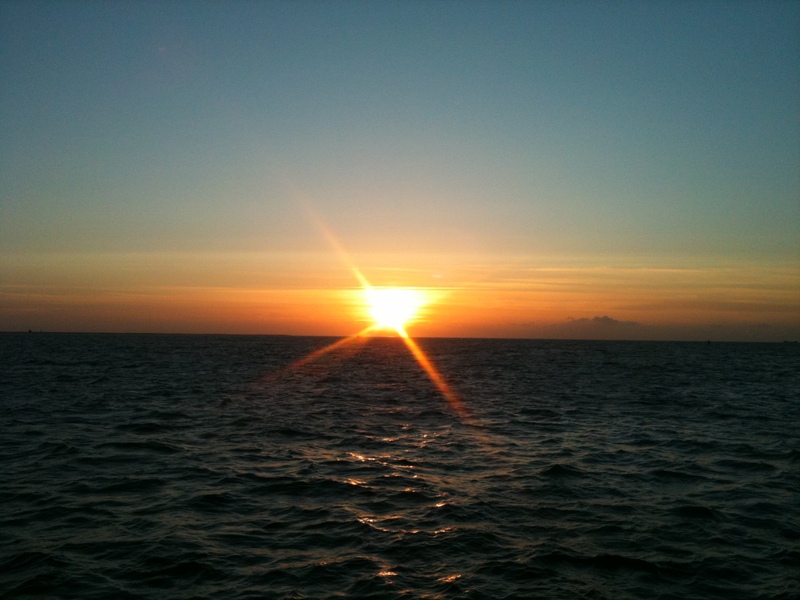 I love the sea and particularly the sunrise and sunsets. Thanks for sharing. Thanks for sharing photos Steve – very atmospheric. We live in Orkney only 15 minutes walk from great views of the Atlantic.